An unusually coloured, premium summer-flowering clematis bred by world-renowned specialist Raymond Evision. Clematis 'Avant-Garde' is a unique, double flowered climber which blooms profusely with a multitude of two-tone, magenta and pink flowers over a long period. Being a viticella variety, it is robust and vigorous, and easy to maintain - it can be grown just about anywhere with no effort at all! 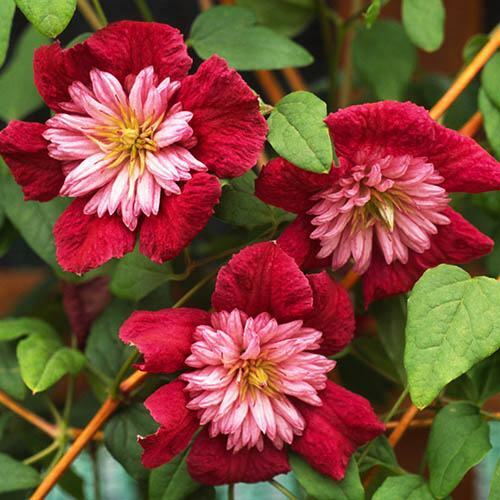 'Avant Garde' is a spectacular clematis suitable for any garden - grow it in borders over trellis, up walls, or even in pots on your deck, patio or balcony. Growing to around 3m (12ft) it will quickly cover most structures that it is grown against. Supplied as an established plant in a 7cm pot, ready to pot on or plant out when the weather warms. This unique, double flowered climber features an outer ring of curved magenta petals (or more correctly tepals as they are neither petals nor sepals), around a central crown of pale pink petals. Clematis 'Avant-Garde' is a viticella variety, which means that is robust and vigorous, and easy to maintain - as the stems simply need to be cut to just above ground level, it can be grown just about anywhere with no effort at all! Blooming profusely with a multitude of two-tone flowers over a long period, 'Avant Garde' is a spectacular clematis suitable for any garden - grow it in borders over trellis, up walls, or even in pots on your deck, patio or balcony where it will add height and interest. Simply a delight when allowed to scramble through roses, shrubs or small trees, Avant Garde is deciduous climber growing to around 3m (12ft) and its medium-sized, semi-double flowers (up to 5cm, 2in) will quickly cover most structures that it is grown against. Supplied as an established plant in a 7cm pot, ready to pot on or plant out when the weather warms. Supplied as an established plant in a 7cm pot, ready to pot on or plant out when the weather warms. Growing to around 3m (12ft) it will quickly cover most structures that it is grown against. Feed in spring with a general-purpose feed, avoiding the stems. Mulch immediately afterwards with organic matter such as well-rotted manure, leaf mould or garden compost. Pruning is a case of a simple tidy up - in late winter/early spring simply reduce all stems down to 6' (15cm) of soil level.